"Happy Days," one of the most popular shows in television history, faces an unhappy legacy nearly four decades after it first went on the air. Cast members say their images on slot machines made them wonder what had happened to merchandising fees. Four cast members, and the estate of Tom Bosley, who died last October, claim CBS (CBS, Fortune 500), which owns the show, has not paid them for merchandising revenues they are owed under their contracts. The show, which originally aired from 1974 to 1984, "represented to the public what the best of America has to offer," said Anson Williams, who played Potsie. "The friendships, the opportunities, the warmth. Unfortunately, now 'Happy Days' also represents the worst of America -- of what major companies are trying to get from it, trying to use it for, and forgetting the family it created." In exclusive interviews with CNN, the cast members -- Williams, Don Most, Marion Ross and Erin Moran -- all claim they have been cut out of the merchandising bonanza the show has spawned. Those products includes comic books, t-shirts, scrapbooks, trading cards, games, lunch boxes, dolls, toy cars, magnets, greeting cards and DVDs where their images appear on the box covers. Henry Winkler, who played the Fonz on "Happy Days," said he supports his former cast members. "I support them because they are my family and we are as close now as we are then," Winkler told CNN in a phone interview. Winkler said he was not part of the lawsuit because he had a separate deal and has been paid for the use of his image on merchandising. "We figured out it would be better if I was not part of the lawsuit because I had been paid and that would have muddied the waters for them probably," he said. When the actors learned their images were also put on "Happy Days," slot machines, they said they began wondering where all the money ended up. "When these slot machines came out, it was like Barnum and Bailey came to town," Williams said. "We were bombarded with, oh look at these pictures, they'd be all over the country." Under the actors' contracts, they were supposed to be paid 5% from the net proceeds of merchandising if their sole image were used, and 2 1/2% if they were in a group. The studio could deduct 50% off the top as a "handling fee." Attorney Jon Pfeiffer represents the actors in their case against CBS, which owns the show. He filed a breach-of-contract lawsuit Tuesday in Los Angeles County Superior Court. "The issue is the five cast members of 'Happy Days' were not paid for the royalties for their name and likeness," Pfeiffer told CNN. "That being the use of their picture, use of their name in slot machines, in games, in greeting cards, in t-shirts, anything where you saw a 'Happy Days' face of a character, they were not paid for that." Ron Howard, who played Richie Cunningham, and Henry Winkler, who played the Fonz, are not part of the lawsuit. Howard, through his publicist, declined to comment. Representatives for Winkler have not returned CNN's calls. In 1999, Moran did receive $692 for merchandising after she said she pressed the studio, which was then Paramount Pictures. In a document sent to Moran, Paramount said she was previously paid $8,229 for merchandising, but Moran told CNN she had not received that money. Moran declined to discuss details of her current financial situation but confirmed that last year, she lost her California home to foreclosure after attempts to work out a loan modification with her bank failed. "It definitely could have made a difference," Most said. "I would think so, and right now it could really make a difference because (Moran) is going through a bit of a hard time." The issue, Pfeiffer said, is that "they (the studio) made a promise to pay, they broke their promise -- that's breach of contract. Number two, they made a promise to pay, they purposefully didn't pay, they broke their promise -- the fraud." "And here we have iconic actors. I mean, I grew up watching these people. And yet they got stiffed," Pfeiffer said. He said attempts at mediation to resolve the dispute earlier this year failed. CBS, in a statement e-mailed to CNN, said, "We agree that funds are owed to the actors and have been working with them for quite some time to resolve the issue." A CBS consumer products spokesperson said that would be the company's only comment. In documents provided to the actors, CBS said it only owes them between $8,500 and $9,000 each for the last four years. Most of that money is from slot machine revenues. The actors argue they are owed millions of dollars. Pfeiffer said Bosley "couldn't believe that they didn't know they owed the money. And instead of paying what a small sliver of what CBS is making on these slot machines, they decided not to pay, and he was upset." Just two days before Bosley died, Most said he left him a voice message. "He was upset with what this represented and he wanted to know," Most told CNN. "He called me, and I called him, and he left a message on my machine that said, 'I'm fine, I'm going to be leaving the hospital tomorrow. But I'd really like to hear what's going on.'" Asked why they didn't raise the merchandising issue earlier, Williams said, "We're actors. We were going through other things. We just thought if there was something to be made, we'd get it in the mail. We didn't think about it. But when those slot machines hit, it just woke us all up to look back and say, 'Wait and minute.'" 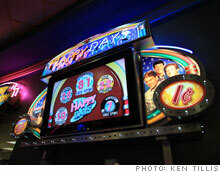 The "Happy Days" slot machines were launched in 2008 and have "performed well for the casinos, which in industry vernacular often means coin-in," Mollie Cole, director of communications for WMS Gaming, wrote in an e-mail. "Happy Days," she wrote, "is a five-level Free Spin Progressive slot machine, where the number of spins increases during play, with three base games -- Cunninghams Go Wild, The Fonz and Richie's Big Night; the latter was a big hit in casinos." She said the company does not release specific numbers showing how many machines are in casinos. Asked about the legal battle ahead, Ross said, "I haven't thought about how long this could go because our lawyers will take care of a lot of it. Once we've stated our case, then that's pretty much our story, and the rest is a legal problem, and I think we have some wonderful people working for us, and I think they'll do a great job." The cast members said their case will be precedent-setting because it's the first time actors from an iconic show have sued over merchandising. "There's a bigger picture here," Most said. "We're one show, but there's many other shows, and we've spoken to many other actors, and they haven't seen any money for merchandising, so we think this is pervasive. This is just the way that business is done, and we have -- in our original contracts, it says we're supposed to get 'X' amount for merchandising -- it says in our contract. But the fact is, we haven't gotten paid, and many other actors in other shows haven't gotten paid." In the last several years, CBS Consumer Products has issued news releases about expanding merchandising deals for its most popular shows, including "Happy Days." For example, the company announced deals with a clothing manufacturers in Italy, Germany, Austria, Switzerland, new apparel collections in Canada, and Bluetooth headsets in the U.S. In addition, plans are in the works for a "Happy Days"-themed lottery game, a spokesman for Alchemy3, which has a licensing deal with CBS to create instant and on-line game tickets for several television shows, told CNN. 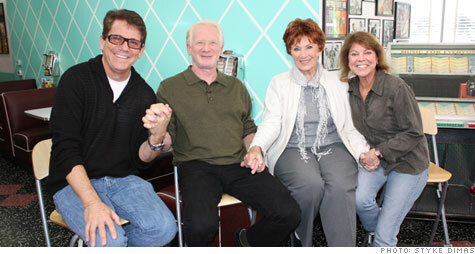 "Happy Days is the type of show that represents the best we can be," Williams said. "It's something warm, something tactile when life was good and life was simple. When friends were there and neighbors were neighbors ... I think it's going to ring in peoples' hearts because it's going beyond this show. It's going to go into their world, into how they're being treated in whatever arena they're working or participating in." But now, "there's a huge juxtaposition for 'Happy Days' to represent the coldness of big business, the wrongdoing of big business and the greed of big business," Williams said. "And the idea that they don't have to abide by contracts, and they can get away with anything as long as they are not caught. And they picked the wrong show."